London: Before a single share moves in regular US trading hours, investors are braced for an ugly New York open, lashed once again by a litany of punitive forces. They’re rushing to hedge sinking S&P 500 futures, while oil is tumbling as OPEC struggles to agree on an output cut. “So much for a pause in the action," Stephen Innes, head of Asia-pacific trading at Oanda Corp. wrote to clients. “‘Sell All’ battle cries are ringing out across trading floors again." Here are the charts that show the grim open awaiting the US market. 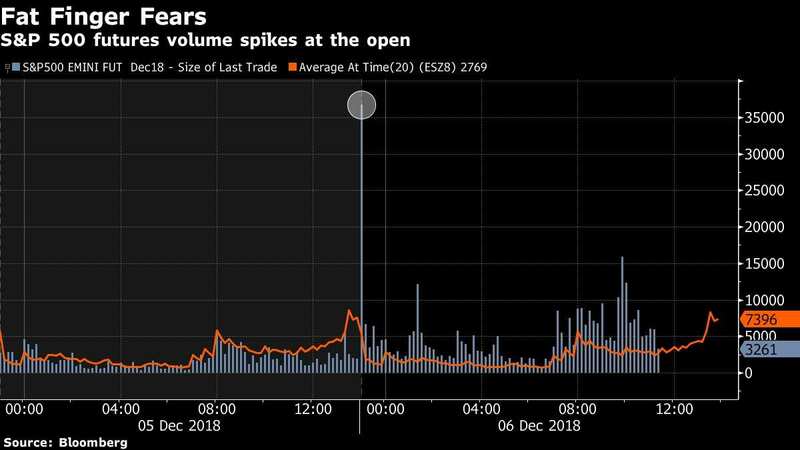 The selling pressure in US equity futures was so immense in the first six minutes of trading the CME Group Inc. was forced to trigger multiple so-called velocity logic events — market pauses to prevent severe price swings. At the open US futures then duly dropped 1.9% from Tuesday’s close as 36,720 shares were traded in the first 10 minutes. That far exceeds the one-month average of 5,262 shares. Pre-market action across exchange-traded funds show investors are sniffing all manner of tactical and strategic plays across assets. The five biggest gainers in US ETFs with more than $500 million in assets are funds betting on a swift market plunge. The top two are volatility funds which bet that equity-price swings will erupt. The VelocityShares Daily two-times leveraged VIX fund gained 15% as of 9:07 am in New York. The next three were funds that wager against the Nasdaq and the S&P 500. Likewise, the VIX itself spiked to 24, the highest level in more than a month. Crude’s 3.4% plunge hypnotized investors during early morning trading. 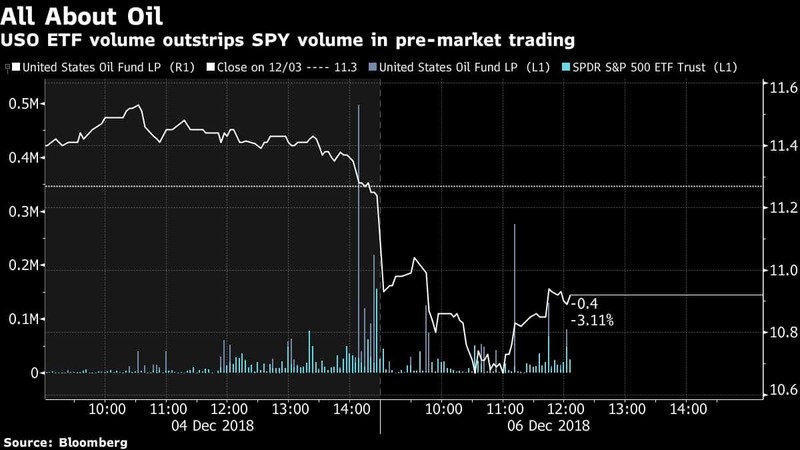 Volume in the United States Oil ETF, or ticker USO, at one point was outstripping the largest exchange-traded fund, the SPDR S&P 500 ETF, or SPY. That’s a big deal: On average over the past five years, SPY sees more than four times the daily action of the oil benchmark. “Suddenly there’s a wall of worry that looks like it’s made out of cinder blocks and not lego blocks any more," Bob Michele, the chief investment officer and head of global fixed income at JPMorgan Asset Management, said on Bloomberg TV.